Why Does Coffee Make Me Feel Weird? If you've ever craved a cup of coffee to get yourself going in the morning, you know the appeal of caffeine. According to Columbia University Health Services, caffeine is consumed by as much as 90 percent of the world population in one form or another. Much of this consumption is through coffee, a popular beverage worldwide. But despite its popularity, coffee can sometimes lead to unpleasant or strange-feeling side effects. 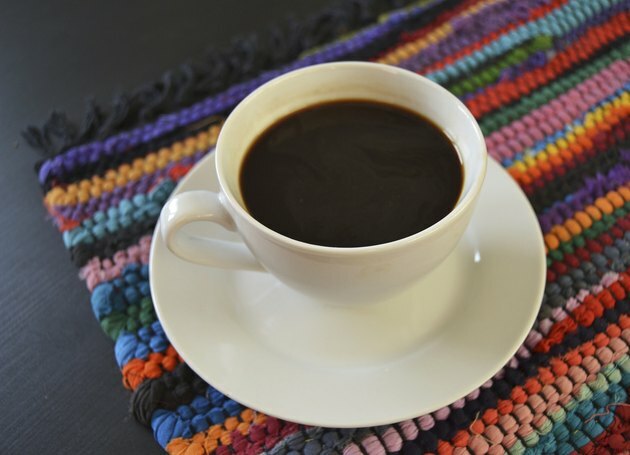 Although the acid in coffee can sometimes cause bothersome side effects -- such as stomach upset -- it's more likely that, if you feel strange after drinking coffee, the culprit is caffeine. To understand why drinking coffee might make you feel strange, it's important to understand the basics of caffeine. Brown University Health Services state that caffeine is a central nervous system stimulant. As such, caffeine is a drug, albeit a legal, widely used and usually harmless one. Found in around 60 plants in the world, caffeine is an ingredient commonly found in beverages like coffee, tea, soda, energy drinks and some sports drinks, as well as in chocolate and certain over-the-counter pain-reliever medications. Stimulants such as caffeine have a variety of effects on your body. Caffeine increases adrenaline production and thus speeds up your heart rate and breathing and raises your blood pressure. According to Brown University Health Services, caffeine can also cause jittery feelings, anxiety, insomnia, excitability, poor concentration, headaches and restlessness. Some people experience dizziness or nausea after ingesting large amounts of caffeine. If any of these symptoms and sensations describe how you feel after drinking coffee, you are likely experiencing unpleasant stimulating effects of caffeine. Most people think of coffee as harmless, and for many people, consuming it in moderation is. The University of Illinois at Urbana-Champaign McKinley Health Center states that up to about 300 mg of caffeine, or the amount in roughly 3 cups of coffee, is generally considered safe. However, if you're pregnant or breastfeeding, you may want to consult your physician for advice on safe coffee consumption. Everyone reacts to caffeine differently, and an amount of coffee that is fine for someone else may give you bothersome side effects. If you experience strange sensations after drinking coffee, you may wish to cut down on your coffee consumption or even eliminate it from your diet completely. If you have concerns about your symptoms, consult your physician for evaluation and recommendations. Can Caffeine Make You Feel Short of Breath? What Causes a Person to Crash After Drinking Caffeine?